I’m back to answer more of your questions! Today I’ll be talking about some food-related things you all have had concerns about, as well as a little bit more about time management and organization. 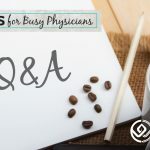 You’ll hear my recommendations for meal times, advice for staying organized, and more. And don’t forget: If you have questions, I want to hear them! It’s as simple as sending me a quick email. I love doing Q & A sessions, and I’m so excited to share today’s episode with you. I hope you enjoy it! How long you should spend at each meal. A good thing to mix in your coffee. What to do before you drink coffee in the morning—and between each cup. The benefits of not being on caffeine all the time. Why it’s beneficial to set up a daily task list that’s separate from your overall to-do list. The benefits of bullet journals. 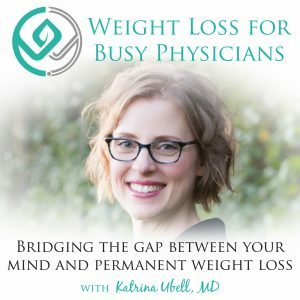 Katrina Ubell: You are listening to the Weight Loss for Busy Physicians podcast with Katrina Ubell, MD episode number 93. 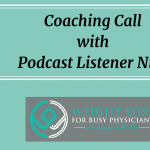 Welcome to Weight Loss for Busy Physicians, the podcast for busy doctors like you get the practical solutions and support you need to permanently lose the weight so you can feel better and have the life you want. If you’re looking to overcome your stress eating and exhaustion and move into freedom around food, you’re in the right place. Hey friend, how are you? So glad that you are back on the podcast today. I am answering more of your questions today and I cannot wait to get started because this is just my favorite. I love hearing from you and I love answering your questions. If you would like to submit a question for me to answer on a future podcast, there’s two ways that you can go about doing it. One, is to just shoot me an e-mail and you can do that at hello@katrinaubellmd.com. The other way is to go to the show notes page for this episode or really any episode of the podcast, but the show notes page link for this episode is katrinaubellmd.com/93, the number 93. And you can scroll down and leave your comment or your question for me and I would love to answer it for you on a future podcast. So, any burning questions you have, it does not have to be food related. I actually love answering the ones that are more thought related, like the deeper stuff. Because here’s what you realize when you really get going on this work and all of my clients will agree, is that it’s really not about the food. The food is just a symptom of the deeper problem. So we can spend a lot of time talking about food and should I eat this and should I eat that, the other thing? And like maybe it matters, maybe it doesn’t. Ultimately, what matters is why you’re overeating in the first place. What you’re using, food and maybe alcohol, for that is in order for you to deal with your emotions, for you to deal with your life. That’s what I want to dig into because it’s so much more important. Now, of course when I work with my clients I help them with all the food stuff, but once we get that all squared away, then we don’t really talk about food that much at all anymore. We really just talk about all the deeper stuff, like all the stuff that feel so hard in life and that we end up using food to manage. So I’m going to talk today a little bit about some kind of food related things ’cause you guys do have some questions about that. And then also a little bit more about the time management and organization types of things. Because I know a lot of you have questions about those and I wanted to make sure that we get on top of those. Because once you can get your life in order, your mind is in order. Like your organization is literally just a reflection of what’s going on in your brain. So once you get that all clear and nice and neat, then you have space in your brain to think about other things, which is brilliant. So let’s get going. Okay. So great questions. So let’s talk about the first one. How long do I advise spending at each meal? This person wrote 30 minutes to one hour as a possibility. I don’t know about you guys, but unless I’m sitting in a restaurant, I don’t usually have an hour to eat my meal, especially think about lunch in a clinic setting or if you’re in between cases and stuff. I just don’t even think an hour is necessary. That’s a long time to eat your food in general. So I find that it’s usually more the opposite that is the problem and that’s that we inhale our food. We learn to do that in medical school and in residency. Like we had no time, this is your chance to eat, you better just pound it down because you might not be able to eat again for hours. And maybe some of us even came from families where everyone just ate quickly. I think I’ve shared with you guys before that was for sure my family. And I really learned to slow down when I married someone who eats much slower and then my first child was the most ridiculously slow eater for a very long time. And I resisted that for a long time and finally was like, “Maybe I could just eat slower too. What would that be like?” And so, I wouldn’t say I’m a slow eater but I think I’m pretty normal now. Like that feels normal, it doesn’t feel right to rush through my food anymore, which it’s just habit. Just changing habits. So, how long to spend at your meal? I like to encourage you to spend 15 minutes if possible, 15 to 20. Just a normal meal will take about that long if you’re not just gulping it down. If you’re chewing it up and swallowing it and actually tasting it and enjoying it and that kind of thing. So aim for that, if it takes a little longer ’cause you’re talking and enjoying yourself, of course, it’s totally great. No problem there at all. But if you are finding yourself going much, much over then you’re probably being distracted. And then we’re almost eating many meals. I don’t know if it makes that big of a difference but it’s probably better to just sit down, enjoy it, eat it and then be done with that meal. All right. Anyway. Okay, so the other question was sipping on coffee all morning. So this person says I switched to coffee with half and half so I’m assuming that that person was drinking like something with like a sweet and creamer in it or like some sort of kind of like a camo macchiato or mocha or something like that. So I actually, most of the time didn’t drink something like that, what my thing was that I grazed on all morning, that I sipped on all morning was a chai, which a chai tea latte or so. That of course had the lactose that is in the milk, which is a sugar and then also just the sweetener in it. So, that for sure helped keep my hunger at bay but it also kept me in weight gaining mode all day as well. So, here’s what I suggest with the coffee. So if you’re going to do coffee, I actually recommend that you do it with heavy whipping cream if at all possible. So what half and half is, even though people call it cream, it’s half heavy whipping cream and half whole milk. So that means that there’s going to be some lactose in with that, which means there’s some carbohydrate. And what ends up happening with that, is that can break your fast. If you’re just doing coffee in the morning and trying to just eat all of your food over the course of two or three meals but a narrower eating window to keep your insulin levels lower, then I would recommend that you do coffee with heavy whipping cream or some other straight fat. As close to straight fat as you can. So, you can definitely get that there. Other coffee shops you might have to just ask. And then I’ve definitely had clients who’ve just brought their own heavy cream to their office and they keep it in the fridge. Or if they have a little fridge in their personal office or something, they just keep it in there if it’s not available otherwise. So then sipping on it throughout the morning is actually brilliant because what you’re doing when you’re consuming more fat … Like if you have enough fat then you will have an insulin surge and we’re trying to keep that low, like that’s the point. So if you’re having just a little sip here and a little sip there, you’re not having that much very frequently. That’s what people call fat fasting. We’re having just a little bit of fat to keep the hunger at bay and give you a little energy but it’s not breaking your fast. So that’s what I recommend doing with that but no sweetener in there. I recommend that you don’t put even any noncaloric sweeteners in there and just do the cream. Let your taste buds adapt. If you find that even so, it’s just the coffee is so strong, you might just be having too strong of a roast. Like you might just be using some sort of really strong or kind of bitter roast and something lighter or just different. It might not taste so achy to you. I’ve had some clients be like, “It turns out I don’t even like coffee if it doesn’t have all the sweetener and all the good stuff in it.” I’m like, “Great, now you don’t have to drink it anymore. You can just drink something else. You don’t even like it, it turns out.” But if you do like it then you just … Solutions-focused, like come up with something, there’s go to be a solution. Okay, the next question is related. So it says, “Hey Katrina, thanks for your podcast. Fellow MD here. Can you address coffee addiction on your podcast? Coffee has been my best friend for the last 15 years. Thanks so much.” So hey, trust me, I get it. I like coffee a lot. My deal is that I get addicted to caffeine very, very quickly. And it’s hard for me to get off in the sense that it’s not just a week of headaches, it’s like three plus weeks of feeling awful. So I’ve gotten off of it many times in my life and I kind of have my little way I like to do it where I just really, really gradually mix the beans and just really slowly wean myself off and then I don’t get those side effects. But for the most part, I really just try not to have it. Now, I can have a little bit if I’m traveling in Europe or something, they tend to not have decaf. I can have a little here and there and it’s fine. But if I start having it every day for a week or plus, that’s until I’m right back on it again. Now, if it’s a coffee thing and you’re like, “Gosh, I’m just drinking coffee all day.” This is actually really common and I see this in my clients a lot. They start being like, “Okay, well, if I can’t have sugar then I’m just going to drink this coffee all day long.” And they’re having tons of coffee with cream all day long, sipping on it all day long. So here’s what I suggest, I suggest that you have a bottle of water and you alternate the coffee with the water. You can have your first cup … Well, actually what I actually suggest is that you drink a whole liter of water when you get up and then you have to drink all that before you can have your coffee. That’s what I suggest because so many of you are not hydrated enough at all and then you’re like, “Oh, I feel like crap.” And then you drink coffee to feel better but what you really need is some water. And for a lot of you, you probably won’t drink any more water like for the majority of the day until you get back home again. So starting off the day with a lot of water, you’re never going to regret it. It’s so good for you, so good for your body. So start off with a bunch of water then you can have your coffee, your first cup. Then you cannot have more coffee until you drink a bottle of water again. And you just keep alternating. So many of my clients are worried about being hungry or just fearful that they might be hungry or, “Oh, I felt a little pain of hunger. I better get a coffee and cream so that I’m not feeling hungry.” And I want to make sure that that’s not just a dehydration issue. When you’re drinking a lot of coffee like that, it’s just you’re not really hydrating your body especially if it’s caffeinated. So you are somewhat but your body likes water so my suggestion is just to do the alternating. But I don’t think there’s anything wrong with drinking coffee, especially if you are switching to decaf later in the day so that your sleep is good. It’s just more making sure that you actually get some true hydration in your body in the form of water as well. And you can add a little squeeze of lemon or lime in it if you want to, that’s totally fine. Okay. So let me get this a little clear. I know that’s not a live, you have questions about this. Even my clients have asked me questions about this. So I just want to make sure that we kind of address this. So, here’s how I divide these things up. I have the Google Calendar and that is for things that are time-specific. An appointment, a meeting, I need to be somewhere at a certain time, pick a kid up at a certain time. Get anything that has a time assigned to it, goes on the Google Calendar. That is what I carry with me because it’s on my phone. And so I like being able to have that calendar on my phone because wherever I am and checking e-mail, I need to plank something in there really quick or just whatever new thing comes up, and I just want to be able to check if I’m available so I know that I have that with me at all times. You ask about if I keep my Bullet Journal in the same location as my bound daily calendar. The bound daily calendar that I have is only for business purposes. Like I have this little cheapo calendar that our Northwestern Mutual agents sends us every year for free. And I just kind of like the size of it and it’s kind of compact but big enough and I just do little bit of organization for business. And mostly my podcast stuff goes on there, just me keeping track of where I am with everything. So that stays home, I never take that anywhere. So I just keep track of that and making sure that I get all the things done and check it off. Just a little way of organizing myself based on the true calendar. I could do that in my Bullet Journal as well, I just choose not to. So my Bullet Journal also rarely leaves my house. It does on occasion depending if I’m traveling or if I’m just wanting to do a little bit of work or organization or something like that. But that pretty much lives at home and everything in there is not as time-sensitive. Like it may have a due date but it’s not like at three o’clock, I need to be x place. So, that’s what’s different. It’s just more a list of all the things that I want to do. It’s that monthly task list and then the daily to-do list task list that gives me an idea of like, “Okay, these are the things that I need to do today,” and get those things done. But they’re not so time-specific. Now, sometimes I’ll look at what I need to get done and then I’m kind of like, “Wow, how am I going to get that all done in this day? Like this is a lot and I’m pretty efficient.” But throw a new puppy in there sleeping right next to me, got a little girl. And we actually have two puppies, right now I’ve only got one with me but it’s just sometimes it feels like, “Okay, I think I can get this all done but I need to be very deliberate in my time.” And that’s where those PDF sheets come in. So, that’s with the 15-minute increments and then what I do is I block off all the things that are not optional. Like for me, when I can start working, like when I’ve dropped the kids off, when I’m picking them back up again, if I have any meetings or calls or certain things that I have to do and then I see what white space I have left, and I compare that to the list of things I want to get done and then I start scheduling it. I’m like, “Okay, I’m going to give myself 15 minutes for this.” Or sometimes it’s like, “I can get three of these things done in this 15-minute block.” Sometimes it’s just a couple of phone calls that need to be made and sometimes it’s like, “Okay, I’m going to give myself an hour and a half and I’m going to write my outline, record a podcast and have everything all done for it, all uploaded to the people who need it in this hour and a half.” Like done. It has to be done by that time. So that’s not like a stressful thing, that’s a keeping me going kind of a thing. That’s a light a fire under me kind of a thing. Like I’ve got this time and I literally do not have other time to do it so I’m just going to get it done. Done, done, done. Done is better than thinking about it forever. We just want to get it done. So I don’t always do the 15-minute increment pages every single day. I do it when I’m looking and going like, “Okay, how am I going to get this all done?” Because things will take up the amount of space that you give them. So if you’re like, “Well, I have all day to do all of these stuff.” Then the first thing has no limit to how much time it can take. Same things with your chatting. Like I’ll just keep chatting till I’m done and then it takes three hours. No, I’m getting these chats done in the next 45 minutes. The end, done. And then you get to work. You’re not distracted, you’re really focused and you get it done. So I recommend, you asked about carrying things back and forth to the office, you for sure can carry it if you find that to be helpful. I don’t love taking my Bullet Journal out of the house too much because I don’t want to lose it. But you might be someone who isn’t worried about that kind of a thing. I don’t lose a lot of things but I just like knowing exactly where it is in general. If I’m taking my computer somewhere or I’m working somewhere, I take it with me because that’s how I keep track of everything. All the things that I need to do. So that’s what works for me. Of course, you’re going to have to modify it to work for your schedule and what your obligations are and your commitments. I do want to stress again, if you’re looking at the Bullet Journal, do not, please dear God, do not go on YouTube or Pinterest and look. I’ve had so many clients who are like, “I know you said don’t go on there but I did and then I got all overwhelmed.” I’m like, “Right, that’s why I told you not to look at it.” So don’t look. Please don’t look. Go to the Bullet Journal website, I think it’s bulletjournal.com and watch their little very short, it’s like a four-minute video, very, very short. I don’t even do all the things that they say to do in that. And you just keep it very, very neat and easy. And mine has no art in it, it’s just writing, it’s just my stuff. And I’m able to get so much done because of that organization system. So if you have one that’s working for you, please continue. There’s not one right or wrong way to do this, just something that I want to offer to you. I’ve had so many clients who have picked up the Bullet Journal and really loved it and it’s really helped them a lot in terms of not beating themselves up for not getting things done, not having themselves totally disorganized with scraps of paper everywhere, telling them what they should be doing, losing things, forgetting things, all that kind of stuff. So, yeah, this is more of a common but I will just kind of elaborate on this. That is the key thing. We have that natural sense of pleasure we get from accomplishment. And so when you set up that daily task list to set yourself up for success. You are allowing yourself that daily kind of dopamine hit of feeling accomplished versus having this enormous to-do list that will never be done and always feeling like you’re behind and then feeling like, what’s the point? You might as well go and get a snack because you feel so bad. Like it really is just a matter of having that running to-do list and then pulling from it, the things you’re going to do today. And if you have extra time, you can go and pull some more things but you’re only going to pull the things that you know for sure you can get done. And if something comes up, whatever happens and you can’t get to it, you just put a little right-sided arrow on it and you just bring it to the next day. It’s not like, “You failed.” You’re like, “Oh okay, I’m just going to do this the next day.” And what I found is sometimes I keep pushing something forward, forward, forward, finally that I’m like, “This actually doesn’t seem like it’s that important. I’m not wanting to do it, nobody seems to have died ’cause I haven’t done it. Maybe it just doesn’t need to be done. Or maybe I can delegate this to somebody else ’cause I’m just not doing it.” So don’t make that mean something negative about me, I just look at it like maybe this actually isn’t that important to me. Good to know. So, I highly recommend that. That’s like one of my favorite parts about the Bullet Journal, is having that monthly task list. Just all the things, you just dump everything under your brain and then pulling daily like, “These are the things I’m going to do.” And you decide in advance, “I’m going to do these things, all these obligations.” And then there might be one thing on there by the time you get all your usual stuff done, you might be like, “You know what, I’m behind by 50 dictations or 50 notes, I’m going to work on getting five extra done today. That’s what I’m going to do. I’m going to commit to doing that and then I’ll be behind by 45.” And just keep tripping away at it so that you get all that done. But the way you do that, like those chores don’t get done on their own. Like you have to make a plan. Like if you’re waiting for the day that you feel like completing them, it’s not going to come. What’s going to come is you’re going to eventually have some sort of compelling reason i.e., the hospital system or whoever you work for saying that you’re going to have your privileges revoked if you don’t fill these things out or finish them up. And then, “Oh okay, yeah. ‘Cause now they’re holding my livelihood over my head then I’ll do it.” It doesn’t have to come to that. You really can just decide, “You know what, I’m someone who gets my work done so I’m going to make sure that I set myself up so I can get that work done.” The end. No drama. We just keep it to the math. All right you guys, such great questions. Again, thank you so much. Just again, would love to answer any questions you have so e-mail those to me at hello@katrinaubellmd.com or go to any show notes page. The one for this episode is katrinaubellmd.com/93. Just type it on in there and I’ll do another Q&A call for you guys sometime soon. All right, have a wonderful week and I’ll talk to you soon. Take care, bye, bye. Thanks for joining me today. If you like what you heard here, be sure to hit subscribe in your podcast app so you never miss an episode. You can also get my Busy Doctors Quick-Start Guide to Effective Weight Loss for free by visiting me over at katrinaubellmb.com. HI Katrina, I recently discovered your podcast and really love it and am learning a lot. I’m working my way through your earlier episodes and wanted to ask about emotional responsibility. I understand the concept intellectually but find that it skews towards learning to tolerate things that you maybe should not. Sure if it’s your mom always commenting on your weight and you using your thoughts to leave you unbothered, that might be ok. But what if the best decision for yourself is to avoid a situation or quit the job, or leave the marriage, etc?. Do you address this? How do personal boundaries play into this? I think by always giving the positive examples (eg. changing your thinking about the husband who doesn’t take out the trash, etc), it’s giving a message that you should learn to think differently about things that you currently think are negatives and teach yourself to not be bothered by them rather than taking an action that might be perceived as negative like not talking to someone anymore or quitting something. Check out Episode #32 which is a Q&A all about Emotional Responsibility!